By the looks of Donald Trump's Twitter feed, you might think he is running against CNN, not Hillary Clinton. On Monday afternoon Trump fired off six tweets in a row attacking CNN's news coverage and accusing the network of being the "press shop for Hillary Clinton." He commented that "people believe CNN these days almost as little as they believe Hillary....that's really saying something!" Later Monday, he returned to the subject again with three new tweets accusing the network of biased coverage. It is unclear if Trump personally posted the messages or if a campaign staffer posted them under his name. Some of the anti-CNN tweets were posted at the exact same time the network was televising an interview with a high-profile Clinton critic -- Pat Smith, the mother of an American who was killed during the terrorist attack in Benghazi, Libya, in 2012. But Trump made no mention of that. The tweets came just a couple of hours before CNN was due to release a new national poll about the presidential race, leading to speculation that perhaps Trump was pre-emptively assailing CNN in an attempt to discredit the poll results. The timing was also noteworthy because Trump has been playing defense for days amid widespread coverage of Khizr Khan's anti-Trump speech at the Democratic National Convention. 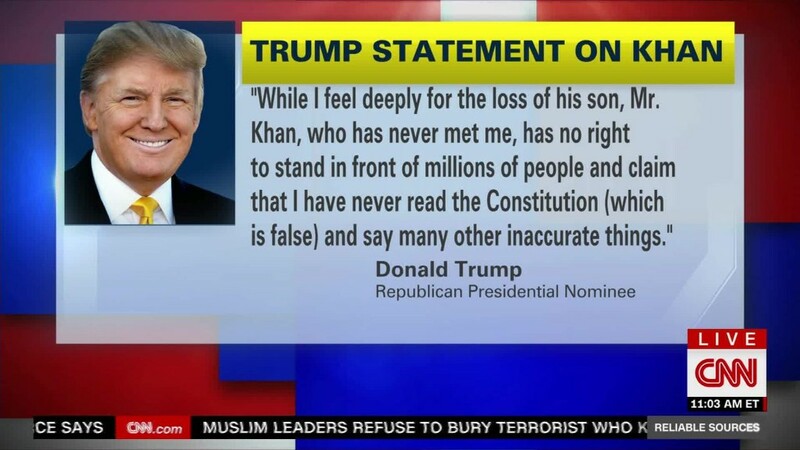 Khan, the father of a Muslim-American Army captain slain in Iraq in 2004, repudiated Trump and paid tribute to his son in the Thursday night speech. Khan's speech -- and Trump's critical comments about the Khan family -- have been a top story on CNN and other channels ever since. Trump has repeatedly claimed that he does not watch CNN, but his tweets seem to hint otherwise. On July 17, he said "I don't watch," but one week later, after the Republican convention, he wrote, "The @CNN panels are so one sided, almost all against Trump. @FoxNews is so much better and the ratings are much higher. Don't watch CNN!" Then the Democratic convention happened and Khan's speech made news. On Sunday evening Trump tweeted, "Wow, it is unbelievable how distorted, one-sided and biased the media is against us. The failing @nytimes is a joke. @CNN is laughable!" On Monday morning he tweeted a fresh complaint about Khan "viciously" attacking him at the same time Khan was on CNN. Then on Monday afternoon, shortly before taking the stage at a town hall event in Ohio, Trump lashed out in his tweetstorm of sorts. "CNN anchors are completely out of touch with everyday people worried about rising crime, failing schools and vanishing jobs," he wrote. He asked if CNN would "send its cameras to the border to show the massive unreported crisis now unfolding -- or are they worried it will hurt Hillary?" In fact, CNN and other news outlets have covered border issues in depth for years. Trump also asked, "When will we see stories from CNN on Clinton Foundation corruption and Hillary's pay-for-play at State Department?" CNN has published numerous investigations into Clinton controversies, including issues involving the family foundation and connections between foundation donors and State Department activities. So have many other news outlets. Some of CNN's stories about these subjects have quoted Trump. At the rally on Monday afternoon, Trump said he is refusing to grant any interviews with CNN, calling the channel's reporting dishonest, and saying Fox News has been better. For more than a month, Trump has been appearing regularly on Fox and eschewing most other TV network interview requests. Accusations of media bias tend to rally Trump supporters to his side. Monday's tweetstorm was just the latest salvo in a year-long anti-media campaign by Trump. The GOP nominee has taken media criticism to new heights -- or new lows, depending on your perspective. He frequently uses the news media as a foil during his speeches and interviews. Last week, he aroused a crowd by falsely claiming that CNN had turned off its camera in the back of the room. The anti-media messaging, while effective with Trump's base of supporters, may get in the way of his other general campaign themes. Journalist Justin Green of Independent Journal called Trump's CNN complaints "exhausting" in a tweet on Monday. He noted that "7 out of Trump's 15 tweets in last 24 hours have been about CNN."